The weather has cooled down some this past week and I am loving it. It's starting to feel like Fall. Fall is absolutely my favorite season. I've already bought some Fall clothes that I'm itching to wear. With early morning temperatures around the mid 60s, I thought it was a perfect excuse to take my leopard cardigan out for a spin. One of the items on my Fall wish list is a bold colored pencil skirt (preferably in mustard yellow or cobalt blue). I would love to have this skirt in every colors but the price tag scares me. While looking through my closet, I found this yellowy-looking skirt. ShopRuche has sent over this skirt last year. I wore it once and totally forgot about it. I love finding “new” items in my closet. I was never a fan of animal print trend. However, I am slowly learning to enjoy a bit of animal print. It is a great way to spice up a simple outfit. Animal print can go either way. It can be fun if done correctly or it can be super tacky if overdone. Since the cardigan is a statement piece, I kept everything light and neutral with the rest of my outfit. Readers, are you excited for Fall? I am extremely excited for layering clothes for fall! I love the first photo! I love the simplicity of this outfit! It really allows the sweater to pop - very chic!! & Nice find in the depths of your closet - great pairing! I'm also looking forward to fall. Can't wait to wear boots again! Love this cardi...and great pairing with the yellow skirt! I'm sure you can tell but I'm completely ready for Fall. This morning on the news I heard "high 50's - low 60's" and I literally ran to find my trench coat : ) I like the fit of this skirt on you. It reminds me of the came H&M skirt that you have which also seems like a favorite of yours. You look stunning! I love this ensemble of you! You look gorgeous Sydney!! I love this look on you! Definitely ready for fall! And ready to start school again so I can dress in work clothes again! your hair is getting so long and pretty, i love it! 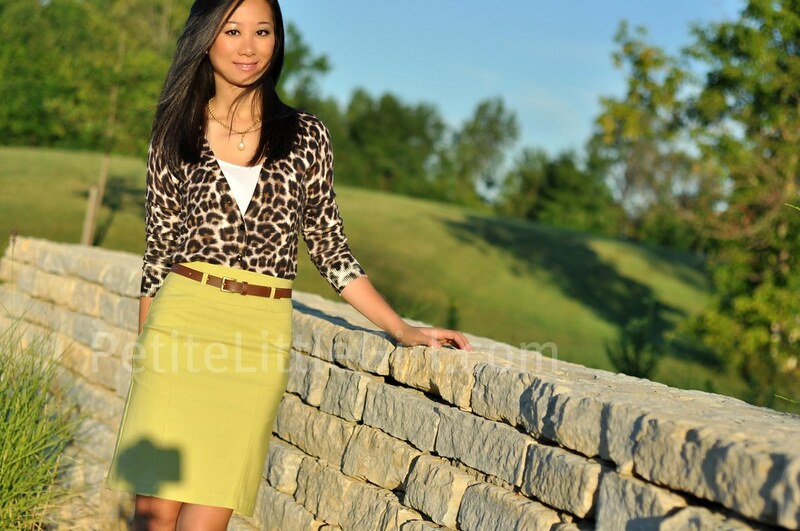 this is a gorgeous fall outfit and i love the color of the skirt with the animal print cardigan. Since you're in Ohio (as opposed to here in Southeast Texas), you can afford to try Fall/Autumn fashion without much penalty. I've always found animal prints to be great as long as they are done in moderation. The skirt and pumps are lovely together in your outfit as your stylish looks shine brightly here. Much respect, Sydney! Great look. I love the leopard and yellowy combo. Loving this outfit! I'm sooooo ready for fall, more than any of you do. (Summer doesn't like me and gives me sun allergy) I can't wait to wear my chunky knits and boots. :) Taking a walk outside will be much more pleasant then. Nice bum, where ya from? ;) LOL I am totally digging this outfit. I have the same cardigan and you make me wanna go out and find a yellow skirt for myself so I can recreate this look. Dare I say this shade of yellow is citrine?! The "it" color of this year? You were way ahead of the trend, Sydney :) Love this pairing and your hair is looking gorgeous today! Leopard is going to be big for fall - you look fantastic in this sleek pre-fall look! I love the look of leopard print but I haven't ventured out of having it on more than just a shoe. You're inspiring me to be brave! I have a light yellow/mustard skirt that I can't wait to wear to work when I return from vacation. I like leopard prints. You look so elegant in this outfit. I still haven't decided on which piece to get at Stella&Dot -- so many to drool over! Lovely outfit Sydney and I'm loving your longer hair.......sooo pretty!! I agree. Head to toe leopard is totally tacky! But you, my dear, are the epitome of elegant in this outfit. Both the skirt and the cardi work well together. I always love leopard print and I totally agree about keeping things simple. Just let the print shine on its own is more than enough. I like the combination of colors. Your hair is getting so long Sydney. aha, i remember that skirt because it was one of my favorite looks on you when I first followed your blog :) And it still looks amazing! This is probably the prettiest yellow skirt from all the bloggers. Leopard print is such a great neutral in my opinion! Love the outfit, very pretty and classy with the pencil skirt. I love your outfit Sydney! Especially the yellow skirt - it looks great against your tan. You look like you're ready to go on a safari haha :) I can't wait for fall either - I love layering during the colder months. loving the leopard accent ! Stunning outfit! So polished, yet fun! @The Little Dust Princess LOL Jessy =) Were you checking me out? I remember you have the exact same cardigan. You look fantastic Sydney, Fall is my favorite season too!